Our exhibition roller banners are portable display stands which have a retractable printed graphic to either one or both sides. These banners are widely used by exhibitors due to their ease of use and relatively low cost but can be found almost anywhere. Therefore often used by schools, companies and organisations for their advertising and marketing requirements. Most roller banners have a standard height of around 2M – 2.2M but if you require yours to be a specific height then please let us know. 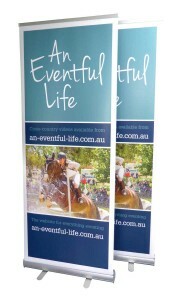 Exhibition roller banners which roll down into a cassette for easy storage and quick display use. Roller banners have many uses. As well as being a firm favourite of exhibitors for instance, these banners are also the perfect choice for the travelling sales person, marketing manager or event organiser. One of the reasons for this is probably because roller banners are extremely quick and easy to erect, thus leaving more time for selling ! This kind of display stand does not have to be single sided. 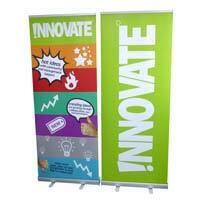 Due to our vast range we also sell double sided roller banners with wide bases that are very easy to use. Consequently if you are looking to display your message on both sides of your banners then we can help. Noteably at RGL we set our standards very high. Hense we do not sell the very cheapest quality base units or low quality graphics unlike many other exhibition banner companies. Instead we prefer to sell a wide range of high quality roller banners which look great and won’t let you down at your exhibition, conference, event or presentation. To help you choose the correct banner for the budget that you have available we have grouped our most popular types into three categories, ‘low cost’, ‘mid-range’ and ‘premium range’. Furthermore we hope that you find what you are looking for but if not please do not hesitate to get in touch. Prices start from just £35+vat. Single and double sided banners available. Multiple order discounts on request. Most brands come with at least a one year warranty. Cost effective banners with printed graphics. Mid-range quality roller banners with wide bases. Premium quality exhibition roller banners. The CRU800 are the cheapest roller banners that we sell and start from £35+vat but they still have a high quality laminated graphic. They have a lightweight budget style base and are supplied in a thin canvas carry bag. If you are looking for something that is low cost and your budget is very small then this is your best option. Alternatively if you can spend slightly more we would recommend our Grasshopper banners which at just £79+vat have a better base unit and a better quality padded carry bag. Although price is often the key requirement when ordering a roller banner we still believe quality wins over cost. Therefore if your budget allows we would highly recommend the Barracuda roller banner. The Barracuda roller banner has long been one of the UK’s biggest selling portable display stands and this isn’t just by chance. Although costing more than cheaper banners these display stands will last for years, not to mention look great and be easy to use. Find out more about our Barracuda banners here.